So, again, let me get this straight. Melky Cabrera, who had a fake web site created to explain his PED usage, doesn't get any more punishment. Neither does Yasmani Grandal. And 2013 All-Star Bartolo Colon, who is 40 years old, 14-3 with a 2.54 ERA, and leading the league in complete games this season, has simply found the fountain of youth, and there is no reason to investigate him any further. It's just a miracle! Madden also told Boomer and Carton: "Trust me on this, guys. This is no vendetta on Selig’s part." Really? It sure sounds like one. Especially given the MLB leaks that Selig plans to 1) ban A-Rod from ever playing baseball again, and 2) wants to punish A-Rod much more harshly than anybody else out there, with an unprecedented use of his powers. If Bud Selig is going to use this to punish Rodriguez, then why hasn't he used that to go after MLB players who drive drunk, beat their wives, or break the law in some other ways? And why didn't he use that against players named in the BALCO scandal? The New York Times says that historically, the clause has only been used for gambling-related offenses, and that the players' union is not happy about the idea of if being used here. In fact, Michael Weiner tells the Times that they have received assurances in the past from Bud Selig that it would not be used in other cases.He also says that “I do not expect" Article XII(B) "to be invoked" in this case. By using Article XI, Selig would risk a federal court case or a reopening of the collective bargaining agreement. If the Players’ Association decides to reopen the CBA to negotiation, the union would still find it difficult to defend Rodriguez because many of its players have abandoned support for the Yankees’ disgraced third baseman. I think Rodriguez's lawyers would relish the chance to put Selig et al under oath. Get your popcorn ready! Is Brian Cashman being insubordinate? Why is he making a stink about the Alfonso Soriano trade? Sorry, folks, but I am not buying Brian Cashman's claim that he was against trading for Alfonso Soriano, and I think he has an agenda behind his claims to be against the trade. Alfonso became the second straight Soriano that Brian Cashman advised Yankees ownership not to acquire — and was overruled on nevertheless. Just as with the signing of free agent Rafael Soriano, the general manager believed Yankees assets could be spent better than on Alfonso Soriano, two executives not affiliated with the Yankees told The Post. In addition, Sherman writes some revisionist history about how Cashman really wanted to sign Russell Martin, even though he said at the time he was too busy taking care of signing starting pitchers to worry about the catching situation. According to multiple executives, [Nate] Schierholtz’s agents were seriously weighing signing with the Yankees, but wanted playing-time assurances and guarantees the Yankees would not sign fellow lefty swingers Josh Hamilton or Suzuki. Except for the fact that 1) Hamilton signed with the Angels a week before Schierholtz went elsewhere, 2) the Yankees never negotiated with Hamilton, and 3) I guess I missed when Schierholtz was so A-list that his agents could dictate such demands to the Yankees. In addition, I have a few other thoughts: First of all, why do executives "not affiliated with the Yankees" know the Yankees' business on the latest Soriano trade? Cashman is a bit of a blabbermouth, isn't he? How is this not insubordinate? Second, Corey Black was a 2012 fourth-round draft pick. I have never heard of the pitcher before this week. Maybe he will be a good pitcher, but given Cashman's shoddy track record on drafting pitchers, I wouldn't polish the Cy Young trophy just yet. 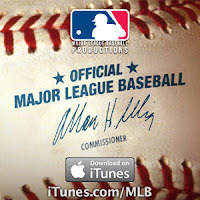 Third, no GM in baseball has 100% autonomy. All of them have to deal with ownership, and get overruled on things. But Brian Cashman is the only one who spreads the Yankees' business, and talks about internal issues, to other executives and newspaper reporters. I think it's insubordination, and he gets away with it again and again. Fourth, the bottom line is this: Brian Cashman is a bad general manager who should lose his job for assembling this bad team. And he is still playing the Steinbrenner card, three years after George's death, and a decade after The Boss was a force to be reckoned with. Why would Cashman be against this trade? It is a quintessential Cashman deal -- trading for an aging player past his prime who makes a lot of money! That's pretty much all he does these days! I think Cashman's opposition to this trade is his way of trying to save his job through the media. He has ginned up the whole "the Steinbrenners are taking away Brian's autonomy again" nonsense, and is trying to get the fans to feel sympathy for poor Brian. The implication, of course, is that if only that meanie Hal Steinbrenner let Brian do his thing, this team would be good. Never mind that Steinbrenner was right, and Cashman was wrong, on the first Soriano deal -- without that pitcher, the Yankees would not have made the playoffs last season after Mariano Rivera got hurt. Having Rafael Soriano was a great contingency plan, something Cashman has shown zero interest in. It's why there is no successor for Jeter and A-Rod. And never mind that no GM in baseball has 100% autonomy -- they all have bosses who overrule them. But we never hear about when they are overruled. That is because they aren't insubordinate to their bosses, the way Cashman is here. Incidentally, you know how we know that the Steinbrenner kids are not acting like their father? Because Brian Cashman still has a job, after second-guessing his bosses in the media. In fact, they are the opposite of their father. They don't have the appetite to fire anybody! Agiain, Cashman is a terrible general manager. He needs to go. And Hal Steinbrenner is not a good owner -- the fact that he has kept Cashman on after his employee publicly second-guessed him in the media shows that. This team needs to clean house -- now -- starting with their idiot GM. The following article is a guest column by DraftStreet.com, a site which offers free and cash fantasy baseball games. It is a look at some of the stars of the 2010 MLB draft, who are already making their mark in the big leagues. The 2010 amateur draft was only three years ago, but four of the top 13 picks made it to the 2013 All-Star Game. The Mets’ Matt Harvey started the game for the National League and Washington’s Bryce Harper started in center field. The White Sox’ Chris Sale was the only pitcher besides Harvey to pitch two innings. Baltimore’s Manny Machado is having a breakout season and just turned 21 on July 6. Harper hit 13 HR over the last two months of the 2012 season and batted .330 in September to win the NL Rookie of the Year with 22 HR, 59 RBI, 98 runs, 18 steals and a .270 BA in 139 games. He got off to a great start in 2013, hitting .344 in April with nine HR, 18 RBI and 18 runs. But Harper hit just .193 in 18 games in May before going on the disabled list with bursitis in his knee. Harper did not return until July 1 and hit just .196 In 14 games in July before the break. Harper was healthy enough to play in the All-Star Game and finish second in the Home Run Derby, so cash fantasy baseball owners can hope that he regains his form and has another strong finish. Harper turns 21 in October. Machado hit .262 with seven HR in 191 AB in 2012, but hit .310 in the first half with seven HR, 45 RBI, 57 runs (ninth-best in the AL) and six steals. He was second in MLB in hits to Miguel Cabrera. Machado leads MLB with 39 doubles and is on pace to threaten the all-time doubles record of 67. Harvey, 24, was the youngest pitcher to start an All-Star game since 23-year-old Dwight Gooden did so in 1988. His 2.35 ERA is tied for third-best in MLB while his 0.915 WHIP is the second-best. Harvey leads the NL with 147 strikeouts. Expect him to have starts skipped occasionally to limit his innings. He is still a good bet for cash fantasy baseball owners, though. Sale, now 24, joined the White Sox just weeks after being drafted. He pitched out of the bullpen in 2010 and 2011, picking up 12 saves. Sale became a starter in 2012 and went 17-8 with a 3.05 ERA, 1.14 WHIP and 192 strikeouts. In 2013, Sale is 6-8, but his 2.85 ERA, 1.01 WHIP and 131 strikeouts all rank in the top five among AL pitchers. This is a guest column from DraftStreet.com, a site where you can join daily fantasy baseball leagues for money or for fun. This is a look at which closers fantasy owners should keep their eyes on after the Mariano Rivera ends. Fantasy owners looking for closers with a long track record of success won’t be able to turn to all-time saves leader Mariano Rivera after this season. Rivera had 638 career saves at the All-Star break. Only four active closers have 250 saves, and only two of them are likely to be closers in 2014. Nathan had at least 35 saves for six straight seasons before undergoing Tommy John surgery and missing all of 2010. The following season, Nathan had only 14 saves. But he returned to form in 2012 with Texas, saving 37 games, and already has 30 saves this season. At 38, he is putting up better numbers than ever, with a 1.36 ERA, 0.756 WHIP and 9.5 K/9. Rodriguez, who pitched for the Milwaukee Brewers for the first half of the year, holds the single-season record for saves with 62 when he was with the Angels. He had four straight seasons of at least 40 saves from 2005-8 and seven straight seasons of at least 23 saves from 2005-11. He stopped closing after going to Milwaukee late in 2011, but returned to the closer role in May after Jim Henderson went on the DL. Now that Henderson is back, Rodriguez has continued to close, finishing the first half with nine saves, a 1.19 ERA, 1.06 WHP and 9.9 K/9. The Brewers, however, were showcasing Rodriguez in hopes of trading him to a contender that might not use him as a closer. And that’s exactly what happened – he was recently traded to the Baltimore Orioles. Valverde went into 2013 with seven straight seasons of at least 25 saves, but also no job until the Tigers signed him to a minor-league contract in April. After saving nine games in 11 chances, Valverde blew a save on June 12, allowed four earned runs in one inning on June 19 and was designated for assignment. Valverde allowed six HR in 19 1/3 IP. Valverde is 35, now pitching for Detroit’s AAA team in Toledo and has no assurance of getting another chance to close in the majors. Those who play in fantasy baseball leagues for money or for fun should skip drafting him. Papelbon went into 2013 with seven straight seasons of at least 30 saves, but unlike Valverde continues to be very productive. Papelbon had 20 saves in the first half along with a 2.33 ERA and 0.91 WHIP. But Papelbon also had five blown saves and a 7.9 K/9, well off of his career mark of 10.6. If the Phillies fall out of the playoff race, there is speculation that Papelbon could be traded, but even if that happened, Papelbon would continue to close. Papelbon holds the record for reaching 200 saves in the fewest number of appearances, breaking the record previously held by Mariano Rivera. He is arguably the best bet as a closer in fantasy baseball leagues for money. Hey, unnamed Yankee player, don't you see the benefits to the "A-Rod circus"? “Guys are just tired of it,” the player said. “The media circus that’s revolving around Alex is insane — and we haven’t even seen him. It just keeps going. It’s like a carousel that just keeps going around and around and around. At some point, it has to stop." "I would like his bat in the lineup. We could obviously use it because the potential for some home runs would help us a lot. But with the circus that’s surrounding him right now, I don’t think anybody wants that. The Yankees are in fourth place, and only a seven-game losing streak by the Toronto Blue Jays has kept the team from sinking further. And forget about the Wild Card -- if the season ended today, the Yanks would not make the playoffs. They are tied for fourth with Cleveland for the Wild Card spot, Yes, the $228M Yankee squad has the same record as the $80M Indians team, whose biggest name (other than Terry Francona) is Nick Swisher. Kevin Youkilis. I've said it all before, but that is one of the worst signings in Yankee history. While the Mets have Matt Harvey and Zack Wheeler and other great young arms soon to be making their way to Flushing, the Yanks have crickets where the Killer Bs used to be. The Yanks are about to trade for Alfonso Soriano. Because any time you can get a 37-year-old with a .286 OBP making $18M a year, you've got to do so. Not to mention his 89 strikeouts as compared to 15 walks! Between Soriano and Vernon Wells, the Yanks could end up paying $20M this year for two has-beens. But they didn't have $7 million to spare to re-sign Russell Martin? Or money for Raul Ibanez? Was two months of Lance Berkman worth Mark Melancon? And so on, and so on. I don't have all day to point out everything wrong with this team, other than to note that without the A-Rod to captivate the media (he's the shiny object they're always focused on), even Teflon Cashman might start to get a little criticism from his lackeys in the media. Incidentally, the very same player screeching about the A-Rod circus also told the News this, regarding what would happen if/when A-Rod were suspended for Biogenesis: “When it’s all said and done, you’ll hear more than enough comments from the guys in here,” he said. “You’ll be able to write it for weeks.” Looks like he is just as guilty as perpetuating the "A-Rod circus" as anybody else. Not to mention the hypocrisy of wanting Rodriguez's bat in the lineup even though the player seems to disapprove of his PED use. Just saying. If you want to Buy New York Yankees tickets -- click that link. If you just want to comment on what I squawked about today, please do so! Is Darryl Strawberry a Yankee or a Met? Read on to hear what he told us! Squawker Jon and I have many ongoing arguments -- that is part of the reason we write a blog together! Anyhow, one of the many things we do not agree on is whether Darryl Strawberry is more of a New York Met or a New York Yankee. So when we got a chance to meet Darryl this week, we got to ask him what he thought! First up, the event, at Slate on 21st Street in Manhattan, was hopping. Along with our cocktails, we got to have some delicious food, courtesy of LYFE Kitchen. (We had flatbread pizza, some cool soups, and yogurt bars -- all tasted great.) Thanks to the folks hosting the party for inviting us! 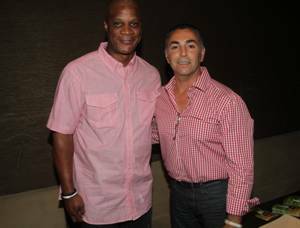 Anyhow, Jon and I got to meet both Darryl Strawberry and John Franco, get autographs of them, and also get our pictures taken with them. Then the photos were printed out for them to sign, and they autographed the pix! Pretty sweet. I talked to Franco about Staten Island (he used to live there.) 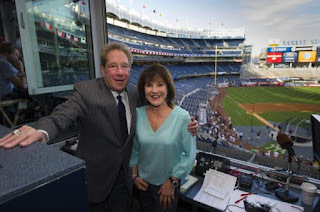 And I explained to Darryl that Jon and I wrote a Yankees-Mets blog together, and that I wanted to know whether he considered himself a Yankee or a Met. What do you think he told us? Drumroll please: He said he considered himself "New York"! What a diplomat! And it means that neither Jon nor I wins the argument! Six Subway Squawkers readers have won Mets DVDs courtesy of MLB Productions Films. Congratulations to our contest winners! To win a copy, please send an email with your name and mailing address and METS DVD GIVEAWAY in the subject line to subwaysquawkers@gmail.com. Six winners will be chosen at random. Contest is open to residents of the continental United States. Contest runs until Monday, July 15 at 11 p.m Eastern Daylight Savings Time. 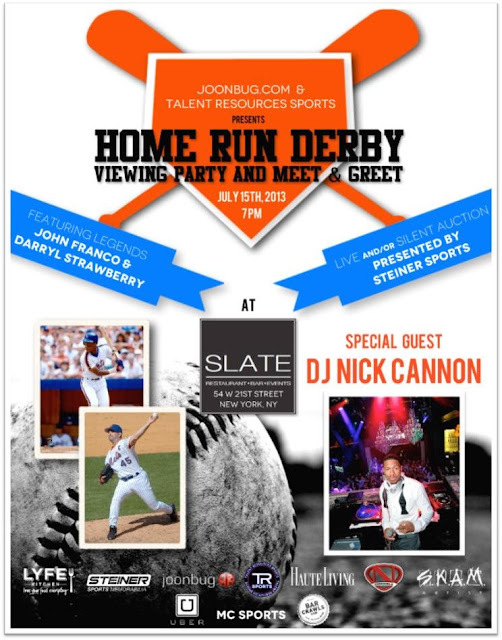 Lisa and I will be watching the Home Run Derby at Slate, which is featuring a meet and greet with Mets greats Darryl Strawberry and John Franco. Slate is at 54 W 21st Street, NY, NY and things get going at 7 PM. Hope to see you there! Lisa will be squawking baseball with Mike Lindsley of ESPN Radio 104.5 FM Albany at 3:30 p.m. today. If you are in the Albany area, you can listen to her on 104.5 FM on the radio. If not, check out the station's website and listen to her there. Thanks! Newspaper reports A-Rod was AWOL - and also reports that he showed up! Yet the same newspaper, and some of the same writers, wrote earlier in the day that A-Rod did show up! Hours after meeting with MLB at an undisclosed Tampa location, Rodriguez trotted onto Steinbrenner Field, the team’s spring training site, to the hushed applause of maybe 50 fans. But a deluge delayed the game, which was eventually postponed. Both articles are still live on the DN website. As James Taranto of the Wall Street Journal says about such coverage, it's two newspapers in one! “I can see a scenario where if they’ve got multiple offenses (against A-Rod) that rather than going for his career with an arbitrator, baseball might settle on something like 150 games,” said one of the sources. If they are, they are the stupidest attorneys in the world, because MLB's Joint Drug Prevention and Treatment Program clearly lists a 50-game suspension for a first offense, and a 100-game suspension for a second offense, with a lifetime ban only coming after the third offense. And try as I may, I could not find anything in MLB's rules on the matter which would justify 150 games, even for alleged multiple offenses at the same time. There is also nothing that says that a player could be banned for life if he were caught at one time with multiple PEDs. And by the way, as I have pointed out before, Melky Cabrera's people set up a fake website to make it look like the substance he tested positive for was legal, and he still only got a 50-game suspension. What is the precedent here for Rodriguez? Why would a 150-game ban be, as another source says in the article, "a victory for both sides"? How does that make any sense? See a great play about working at The Onion! "An aspiring writer who works as the Office Manager at The Shallot, a satirical news organization, hoping to become a writer. While fielding phone calls and dealing with the revolving door of actors and actresses coming into the office for auditions, the Office Manager and intern observe a changing company whose structure, like its product, is funny. Based on a true story about working at The Onion." You can get tickets here, and see a teaser trailer here. Rushing Derek Jeter back to the Yankees after just four rehab starts...gee, what could go wrong? Hey, what could possibly go wrong in having the 39-year-old Derek Jeter come back, after 2 1/2 hours sleep the night before, and after getting a grand total of 9 at-bats in his rehab starts? A tightened quad, which he felt in his return, that's what. Shocker. Given that I was on a radio show 10 days ago talking about how he was finally getting to run the bases for the first time, this all seems way too soon. As we wait to hear what the MRI results are, I want to chastise Brian Cashman and the rest of the Yankee "brain trust" for thinking it was a good idea to bring him back so soon. And please, spare me the whole "just having him around makes the team better." Am I supposed to believe that Andy Pettitte and CC Sabathia will pitch better simply because The Captain is back? That the Yankees will play better defense and hit better just because of his inspiration? The only things that could change is that the Yanks have a better lineup with Jeter hitting well, and other players may also get to see better pitches to hit, because Jeter is back in that lineup. But to expect any one person, even a future first-ballot Hall of Famer, to fix this fourth-place team is too much to ask. Newsflash: Derek Jeter is 39 years old and coming off two ankle injuries. It was irresponsible to rush him back to the majors, even though because he said he wanted to come back. (And incidentally, isn't Cash supposed to tell Derek to STFU about that? Didn't he make a big stink about A-Rod on such an issue all of two weeks ago, with Cashman saying it was up to him when Rodriguez came back? Just saying.) Jeter always wants to play. That is part of what makes him a legend in this town. But that doesn't mean having him play was a good idea right now. And as my Facebook friend Staci noted, how much of bringing Jeter back had to do with putting fannies in the seats, and increasing TV ratings? A lot, I will bet. You would think the Yankees would have learned from rushing back Mark Teixeira and Kevin Youkilis after the team got swept by the Mets, and how it is better to think long-term than risk injury setbacks. So much for that. Here's hoping Derek Jeter is A-OK. I don't want to see him hurt again. Lisa will be squawking baseball on the Bud and the Manchild show on ESPN Radio 1260 the Score in Syracuse at 11 a.m. today. If you are in the Syracuse area, you can listen to her on 1260 AM on the radio. If not, check out the station's website and listen to her there. Thanks! It wasn't that long ago that we were calling Oriole Park at Camden Yards "Yankee Stadium South" and thinking of Baltimore as a franchise down on its heels. Now, thanks to manager Buck Showalter, GM Dan Duquette, and a good young team, the Orioles are a team on its way up, sweeping the Yankees and helping the Bombers head down to fourth place. I watched part of Saturday's game and most of Sunday's game, and it all depressed me very much. Orioles fans have much to be excited about, and to look forward to. They have a good core to their team that is only going to get better. Chris Davis (first drafted by the Yankees, by the way!) has 31 homers, leading the league. Speaking of former Yankees, the O's found a home for former Yankee Chris Dickerson. Adam Jones is a star, and could have been drafted by the Yanks in 2003. Instead, they chose Eric Duncan. This weekend I heard Yankee fans mocking the Orioles about their fans being "frontrunners" and "bandwagon fans" for only filling up the ballpark now. First of all, Yankee fans ought to be careful about using such terms, especially given how empty Yankee Stadium was prior to 1996, and given their own fan base. Second, showing increased attendance and enthusiasm when a team improves is a rational response, as is stopping going to games when the team tanks. This spring, I predicted that the Yanks would finish no higher than third place, and win no more than 86 games. Today, the Yankees are in fourth place, with half the season over, and are on pace to win 84 games. Meanwhile, Pittsburgh has 51 wins already, and just won their ninth in a row, former Yankee Russell Martin had a walkoff hit to help them win, and A.J. Burnett (who is getting $8.5 million not to be a Yankee) gave him the pie! At what point will the Steinbrenner kids realize that the Yankees need a new start? A new GM, and perhaps a new manager? A new team? As long as the money keeps on rolling in, they won't, unfortunately. Good grief.